Geisha house shima was built in 1820 when geisha other houses were moved to Higashi chaya-gai under the control of lord Maeda who governed Kanazawa during that time. Shima was the one of the oldest building and they open to the public. Shima was a geisha restaurant during feudal samurai period. Geisha is an female hostess, waitress and entertainer. Their skill includes playing instruments such as guitar and drum, singing a song and dancing. Although geisha restaurant is restaurant, geisha house normally doesn’t have a kitchen. The foods were delivery service. So, Shima’s kitchen is small. Shima has several rooms for customers. First floor has owner’s room and checkout. The payment was a monthly payment, so at the checkout, the owner recorded the customer’s name and who entertain him when the customer left. The geisha restaurant is membership-only restaurant and only the member or member’s friend could come in. To become a member, the member’s introduction was necessary. The second floor has guest rooms and waiting rooms. They were not big and quite different from modern restaurants. The room is about 15 m2. 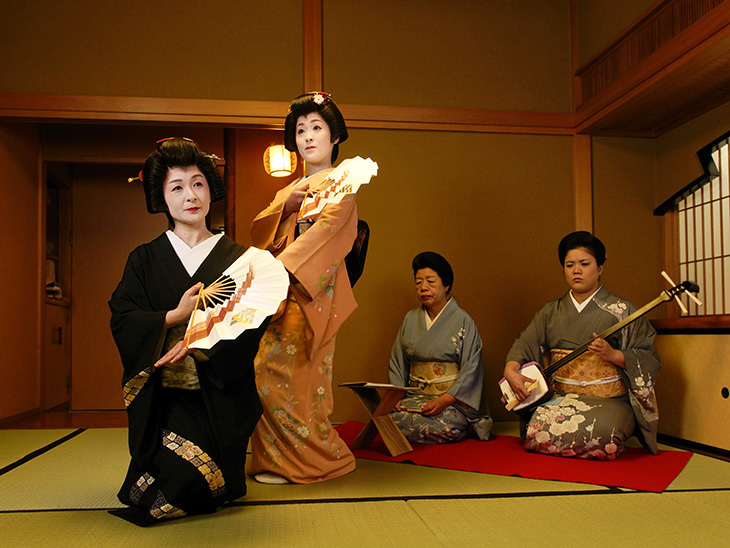 In this room, the customers enjoyed geisha’s entertainment. The room is gorgeous. 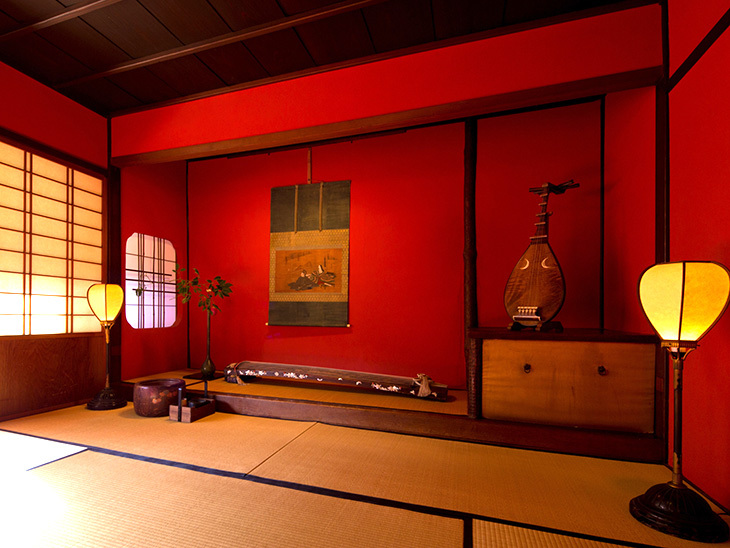 The wall is red, which is considered to be the most gorgeous color in Japanese room. They have a small backyard. You can enjoy Japanese tea in front of backyard. From Kanazawa station, it takes 20 minutes by walking. By bus Kanazawa loop bus (clockwise) is convenient. Take a Kanazawa loop bus (clockwise) from east terminal of Kanazawa station and get off at Hashiba-cho (RL5). Walk back and turn to the right at the second corner. By counterclockwise loop bus, the closest bus stop is Higashi chaya district (LL11).